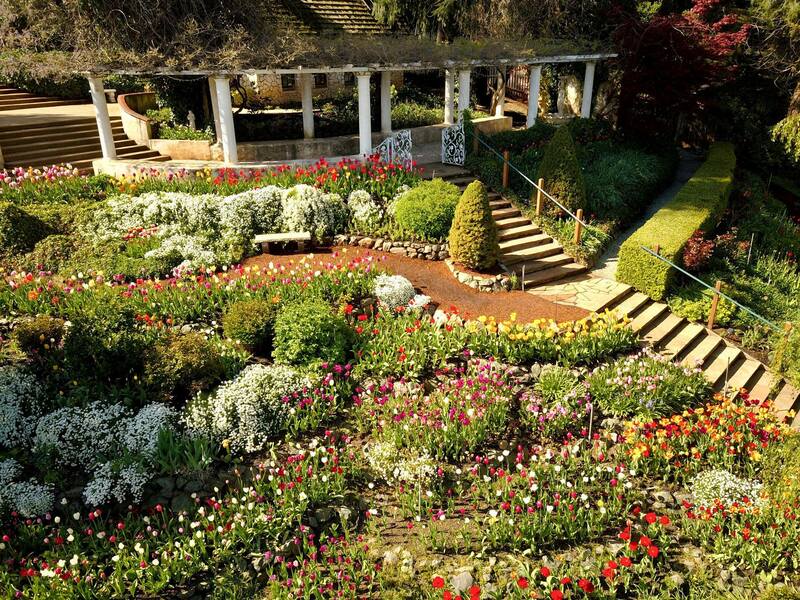 What began 40 years ago as a small private garden by Swami Kriyananda for Ananda Village is now frequently a top Gorgeous Gardens in the West. 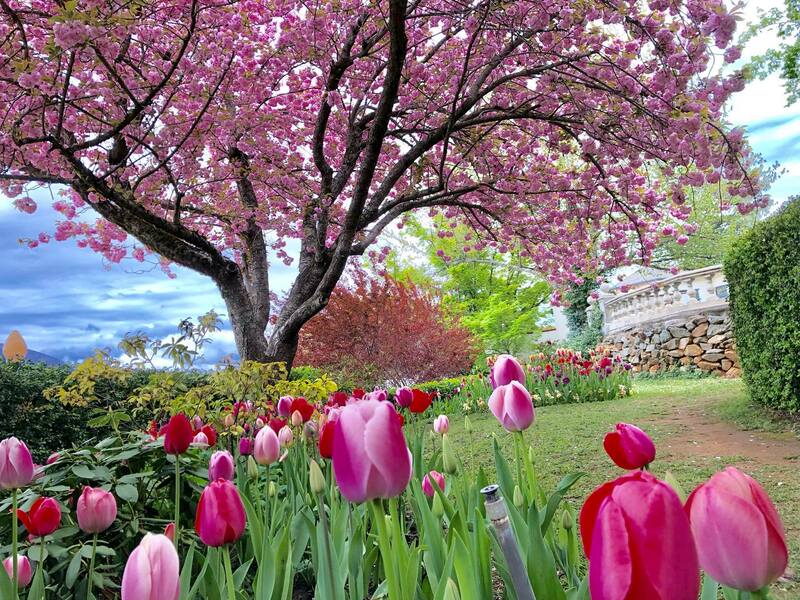 Visiting the garden is an annual springtime tradition in the Sierra Foothills for over 12,000 visitors. 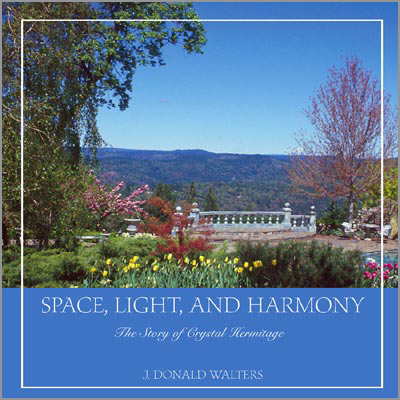 Traveling from as far away as India making Crystal Hermitage gardens the top 3 spots to visit around Nevada City, CA. 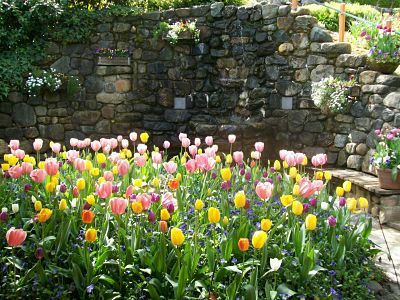 Every year 17,000 tulips bloom in the formal gardens surrounding Crystal Hermitage, giving a spectacular display of color—108 varieties—April through early-May. 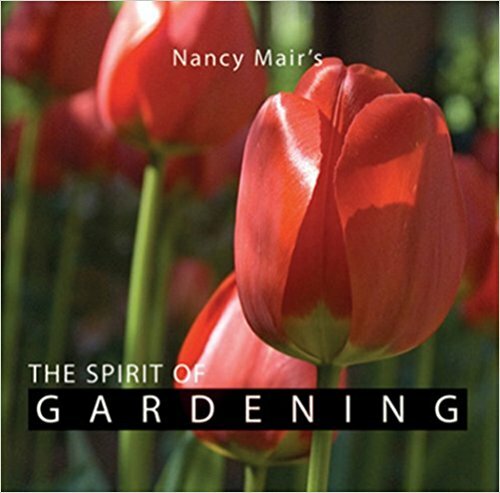 Over 48,000 people have visited the gardens since it opened to the public. A record breaking 12,000 visited the gardens in 2018. 17,000 tulips are planted in the fall. 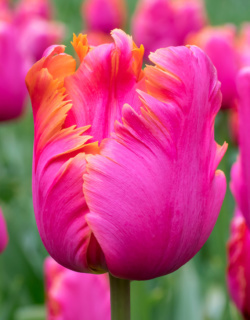 108 types of tulips can be found in the garden. 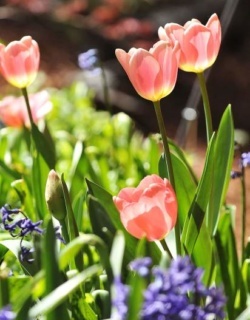 5,000 bedding flowers and plants are planted between tulips. 50 Green Team volunteers and staff plant tulip bulbs and bedding plants from October to January. 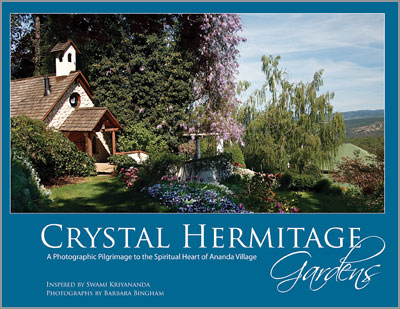 Crystal Hermitage is funded and supported by the generous donors of Ananda Village, friends of Ananda and garden patrons. 1968 a friend built the original dome structure for $5,000. 1984 the main building in the upper garden was completed. Kriyananda named his newly developed home, “Crystal Hermitage.” He consulted local architects, builders, and landscapers, and together with them created beautiful upper and lower gardens and pools. In the upper garden, he had a small meditation chapel built, and (later on) a museum which now holds relics from Yogananda and Ananda’s line of gurus. The main building, below, holds a large dining room and kitchen for banquets and social gatherings. The expansive lower garden he designed to for outdoor concerts and other programs. 2009 the gardens opened to the public for the first time. For nearly 50 years Ananda Village has exemplified the spiritual ideals of Paramhansa Yogananda’s “World Brotherhood Colonies”. Under the guidance and blessing of Swami Kriyananda (1926-2013) and our great guru Yogananda, we have developed communities, schools, businesses, music and the arts, and retreat centers throughout the world where spiritual friendships, meditation, yoga, and selfless service thrive. Visit our anandavillage.org to learn more. … a worldwide movement of over 140,000 people practicing yoga and meditation in daily life. Like the well-known Findhorn, Ananda is a cooperative, spiritual community that began over 50 years ago, and has become an global ambassador of peace. 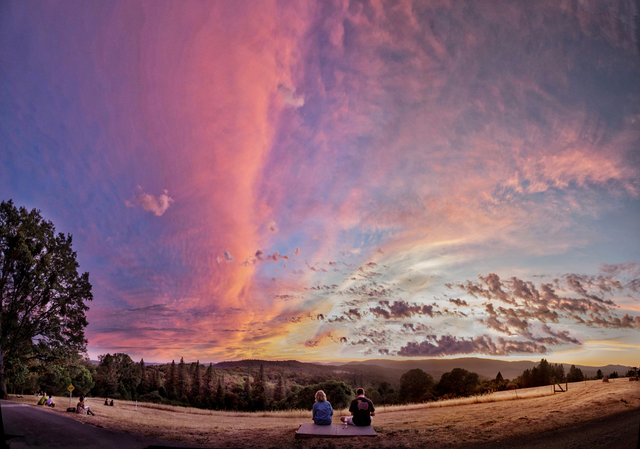 Through 8 communities, 164 teaching temples and meditation groups, 6 retreat centers, and an online community around the world, you can find Ananda near you. Ananda serves people and families seeking an inspired life, one filled with friendship, simple living, spiritual support, ethics, and joy. There is no aspect of your life that cannot be improved by meditation, whether it be in business, relationships, health, or developing any personal quality, such as willpower. Learn more about Ananda meditation techniques and yoga classes. If you would like to get more involved but are not near a center, you are welcome to visit the Ananda Virtual Community. All children are welcome in 5 Living Wisdom Schools near Ananda communities. Education for Life principles guide graduates to live happy and highly successful lives. Ananda’s inspiration and spiritual teachings come from Paramhansa Yogananda and his spiritual lineage. Yogananda came to America in 1920. He was the first guru superstar, showing the unity of Eastern and Western spiritual traditions, and how to live with Divinity in daily life. Swami Kriyananda (1926–2013), a direct disciple of Yogananda, founded the original Ananda Village in the Sierra Foothills near Nevada City, CA in 1969. Through over 150 books and 400 pieces of music (Crystal Clarity Publishing), Swami Kriyananda further illuminated and shared Yogananda’s wisdom with thousands of spiritual seekers who have continued his legacy of daily meditation, kindness and ethical living. With the passing of Swami Kriyananda in 2013, Nayaswami Jyotish was named by Kriyananda as his spiritual successor. Jyotishji met Swami Kriyananda in 1966, working closely with him and his wife, Devi (who came to Ananda in 1969), to build Ananda’s work around the world. Hundreds of friends from around the world will gather in the birthplace of this movement, Ananda Village, to honor the life of Swami Kriyananda, Ananda’s founder and direct disciple of Paramhansa Yogananda, and look to the future together. 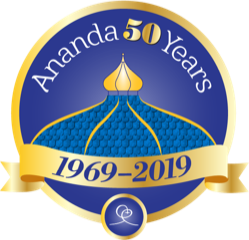 This week-long program will weave together all aspects of Ananda’s worldwide mission — fulfilling the will of the Masters, spiritual community, yoga in daily life, the path of Self-realization — into an experience of divine friendship for all who come. The culminating event of the week will be the dedication of the Temple of Light at Ananda Village, a symbol of the uniting spirit that Ananda represents. Dedicated to truth-seekers everywhere, the Temple of Light is a physical manifestation of Ananda’s mission in every way. 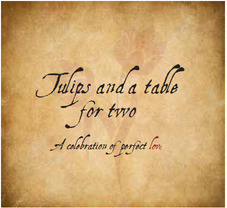 We hope you can come and celebrate this joyful occasion with your worldwide Ananda family. Learn more. Download media-ready images of Crystal Hermitage Gardens as a zip file.